RIO DE JANEIRO, BRAZIL – Brazil are set to face South American rivals Uruguay in the semi-finals of the 2013 FIFA Confederations Cup today (Wednesday, June 26th) at the Mineirão stadium in Belo Horizonte. No matter how much time has passed, and how many victories Brazil manage to amass over their neighbors, the nation seems forever haunted by that final, dubbed the Fateful Final, of 1950. Neymar’s rise in form has helped Brazil into the semi-finals, photo by Wander Roberto/VIPCOMM. Hosting the World Cup for the first time in the aftermath of the Second World War, the Brazilians reached the decisive match as clear favorites. They had previously demolished Sweden and Spain 7-1 and 6-1 respectively in the “second group stage”, a system never used before, or since that tournament. Needing only a draw to secure the Jules Rimet trophy, Brazil had taken the lead early in the second half through Friaça. Brazil were on course for a historic first world triumph, something the 200,000 inside the Maracanã had considered a foregone conclusion. Yet the Uruguayans hadn’t read the script. Schiaffino equalized before, eleven minutes from time, Alfredo Ghiggia scored the most infamous goal in Brazilian history to hand Uruguay their second, and to date last, World Cup title. That game has never been forgotten by Brazil. Now in the present day Uruguay coach Oscar Tábarez is under no illusions who are the favorites for the semi-final clash. “We are going to have to work very hard to limit Brazil’s strong points. But we are going in search of a positive result,” he said. 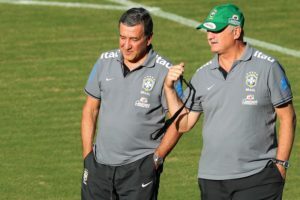 Scolari (right) and Parreira plot Brazil’s Confederations Cup campaign, photo by Wagner Carmo/VIPCOMM. The most recent meetings between the two sides have been to Brazilian advantage. In the last match between the countries four years ago Brazil thrashed Uruguay 4-0 in a 2010 World Cup qualifier in Montevideo. Uruguay’s last victory came in 2001. In a qualifier for the 2002 World Cup, the Celeste defeated their more illustrious neighbors 1-0. The Brazilian coach on that day was Luiz Felipe Scolari, now back in charge for his second spell. In the five matches since there have been four draws and that one Brazilian victory. Two games have been decided on penalties, as could technically happen at the Mineirão today. On both occasions Brazil prevailed, in the 2004 and 2007 editions of the Copa America. Tabárez has built an excellent Uruguayan side however, which finished in fourth place at the 2010 World Cup and says the South American clássico is always an important affair. “To play against Brazil is always motivational for what it represents to football, for how Brazilians feel about football. They [Brazil] are the biggest winners in the world game,” he said. So far in the competition Brazil’s biggest threat has been Neymar. The 21-year-old has been the star performer not only for Brazil but of the entire tournament, having scored in each of the three games played. With one year to go until the 2014 World Cup he has proved he can become the heartbeat of this new look Brazilian line-up. Yet many feel Uruguay will provide Scolari with his sternest test in the Confederations Cup to date.